Mankind is using a greater variety of metals in greater quantities than ever before. As a result there is increasing global concern over the long-term availability of secure and adequate supplies of the metals needed by society. Critical metals, which are those of growing economic importance that might be susceptible to future scarcity, are a particular worry. For many of these we have little information on how they are concentrated in the Earth’s crust, how to extract them from their ores, and how to use, recycle and dispose of them effectively and safely. 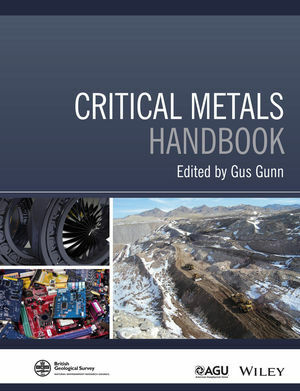 Published with the British Geological Survey, the Critical Metals Handbook brings together a wealth of knowledge on critical metals and provides a foundation for improving the future security and sustainability of critical metal supplies. Written by international experts, it provides a unique source of authoritative information on diverse aspects of the critical metals, including geology, deposits, processing, applications, recycling, environmental issues and markets. It is aimed at a broad non-specialist audience, including professionals and academics working in the exploration and mining sectors, in mining finance and investment, and in mineral processing and manufacturing. It will also be a valuable reference for policy makers concerned with resource management, land-use planning, eco-efficiency, recycling and related fields.